A great Post card for you and your family, friends, visitors and loved ones. 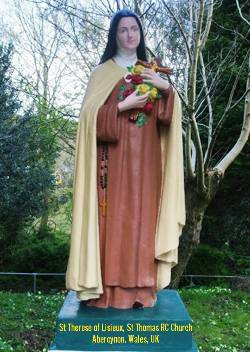 Shows the Newly renovated 85 year old statue of St Therese of Lisieux at St Thomas RC Church, Abercynon, Wales UK. We have introduced this Special collection of Postcards to help the up-keep of the Statue and surrounding grounds. 50% of all proceeds go to St Thomas RC Church for this very much needed maintenance fund. You can keep up to date with the developments of all the renovations by going to our St Thomas Renovations pages, which also include the newly restored Grotto showing Our Lady of Lourdes and St Bernadette and the 14 Stations of the Cross that go down the hill, from the Grotto to the river bank. A great Post card for you and your family, friends, visitors and loved ones. Shows the Newly renovated 85 year old statue of St Therese of Lisieux at St Thomas Church, Wales UK. A great Post card for you and your family, friends, visitors and loved ones. Shows the Newly renovated 85 year old statue of St Therese of Lisieux at St Thomas RC Church, Wales UK.